Aboard the coach from the train station to the Florence Hotel in Missoula, he observed a man riding a bicycle and leading a horse. It was the afternoon of August 5, 1895. The man was Samuel Langhorne Clemens (aka, Mark Twain). The photo enthusiast and companion was his business agent, Major James B. Pond. Clemens, penniless and in ill health, was on the first leg of a two-year international lecture tour to generate money to repay his creditors. Accompanying Clemens were his wife and daughter, Clara, Major Pond and his wife. The Missoula stop was one of five in Montana, one of 23 performances in 22 cities from Cleveland to Vancouver, British Columbia. 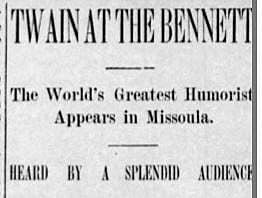 On Thursday, August 1, Twain performed in Butte, where he had an “off night.” Pond was heartbroken for his friend. On Friday, August 2, 1895, the pair boarded a trolley to the train station, but within a few blocks it broke down. “We tried to get a grocery wagon,” Pond recalled, “but the mean owner refused to take us a quarter of a mile to the depot for less than ten dollars. I told him to go to —-. I saw another grocery wagon near by and told its owner I would pay any price to reach that train. On Monday, August 5, 1895, the group headed to the depot to catch the train to Missoula, when they spotted Mrs. Henry Ward Beecher, an old acquaintance, and posed for a photograph. At the Garden City, the commandant from Fort Missoula invited them all to dine with him. The ladies accepted, but Twain was tired and went to bed. Twain recalled youthful days and lessons learned when he stole a watermelon, only to find it was still green. He reflected that a “right-minded boy” would promptly return the stolen property to its owner. So he did. 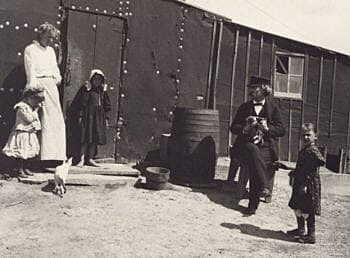 Twain and his companions accepted an invitation to lunch the next day at Fort Missoula, before their departure to Spokane. Twain rose early, deciding to leisurely walk out to the fort. The rest of the party waited for transportation (two army ambulances) sent by the commandant. 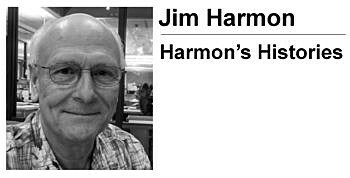 As the ambulances headed west, the party spotted a man – quite a distance away – signaling them. It was Twain. At 2:30 that afternoon, the Twain entourage boarded the westbound Northern Pacific, departing Missoula for Spokane. 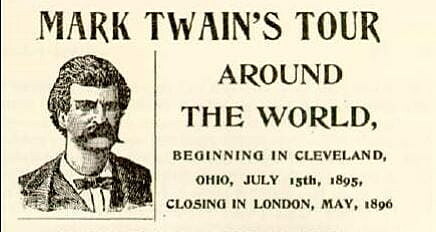 By the end of his “Around the World” tour the next year, Twain had cleared his debt.